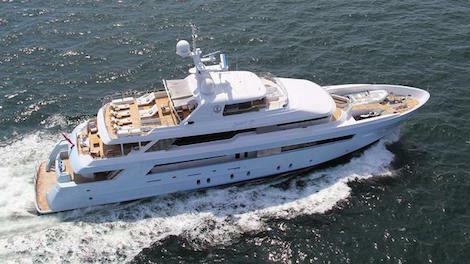 Merle Wood & Associates has announced their appointment as central agents for the 46.2m superyacht, Just J’s. Formerly known as 'Monarch', the 2011 build has been listed with Merle Wood and John Cohen for an asking price of $29 million. The 151-foot motoryacht began construction at Northern Marine in Anacortes with construction of the semi-displacement hull, following which the project was completed by Seattle-based Delta Marine. She is fitted with two CAT 3512 engines, which have seen 1,300 hours usage and have a warranty through to 2017, a feature that may appeal to prospective buyers. With a range of 3,000nm range at 12 knots, she is marginally under the average of 3,548 for 21st century built 40-50m motoryachts, but is still capable of undertaking long-range cruises. Just J’s exterior styling and interior décor is a product of Jonathon Quinn Barnett and Geoffrey Bradfield, who designed the yacht with a large beam at 9.42m to accommodate 10 guests throughout five large staterooms. She is also fitted with a four-deck elevator that runs from the lower guest staterooms to the sun deck.